...sometimes sink. A nasty pothole on a rainy commute home put a big dent in the of my rear Ksyrium SL. The wheel wasn't even out of true, and I made it the rest of the 10 miles home without any issues. 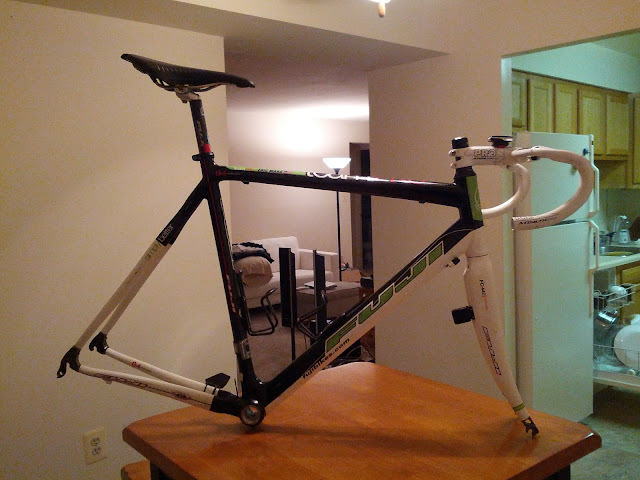 For now, I've moved the ROLs over to the Colnago, and the Ksyrium will go in for repair soon enough. The Fuji is is disassembled down to just the frame, fork and bars awaiting a new parts group and wheelset (DA or Red, Zipp or Enve...yeah gonna be a dream bike build). Artsy shot of the group for eBay. In other news, my buddy Ryan over in Italy just bought himself a sweet rig, a Legend Fedala. Handbuilt Marco Bertolleti steel, Rival/Force mix, Fulcrum Racing Zero wheels. He says his search for Italian Steel was inspired by my Colnago. Right on. Congrats, Ryan. Go forth and crush miles, my son. I teach machines to learn. Bicycles teach me to live.